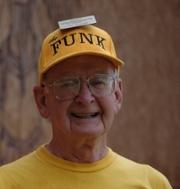 The Funk Heritage Center has an active volunteer program. Volunteers receive a free membership after completing 20 hours of service and active volunteers may receive discounts on selected items in the museum gift shop. When helping with special museum events, volunteers can attend lectures and workshops at no charge. Monthly meetings are held the third Wednesday of each month at 1 p.m. except during July. Meetings allow staff to update volunteers on events and offer occasional training. everyone has an opportunity to socialize after the meeting. A picnic or a dinner is held each spring and each December a special holiday program is held. All volunteers are required to complete background screening. If you are interested in becoming a volunteer, you may complete an application and then either mail it to us at 7300 Reinhardt Circle, Waleska, GA 30183 or fax it to 770-720-5983. Once it is received, you will be contacted to make an appointment for an interview. Volunteer application pdf. These volunteers welcome visitors and provides clerical assistance. When visitors enter the facility, they are greeted by the receptionist who takes their admission fee, gives them a museum guide and directs them to the theater. 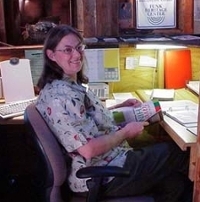 The volunteer also answers the telephone and completes other administrative tasks. Above photo, Linda Baker has been a volunteer receptionist for 10 years. Docents guide adult tours and school field trips. They receive a volunteer training manual providing information about each of the museum galleries. Once the person becomes familiar with the information, the new docent will observe staff or other volunteers leading a tour until they feel confident enough to lead a group on their own. Docents also become familiar with the the Appalachian Settlement and may walk with groups to the Settlement. 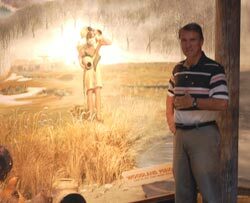 Tom McElhinny(l) and Bob Andrew (r) both guide school students through the museum. Based on the Georgia curriculum standards, they explain Southeastern Indian history to students according to their grade level. 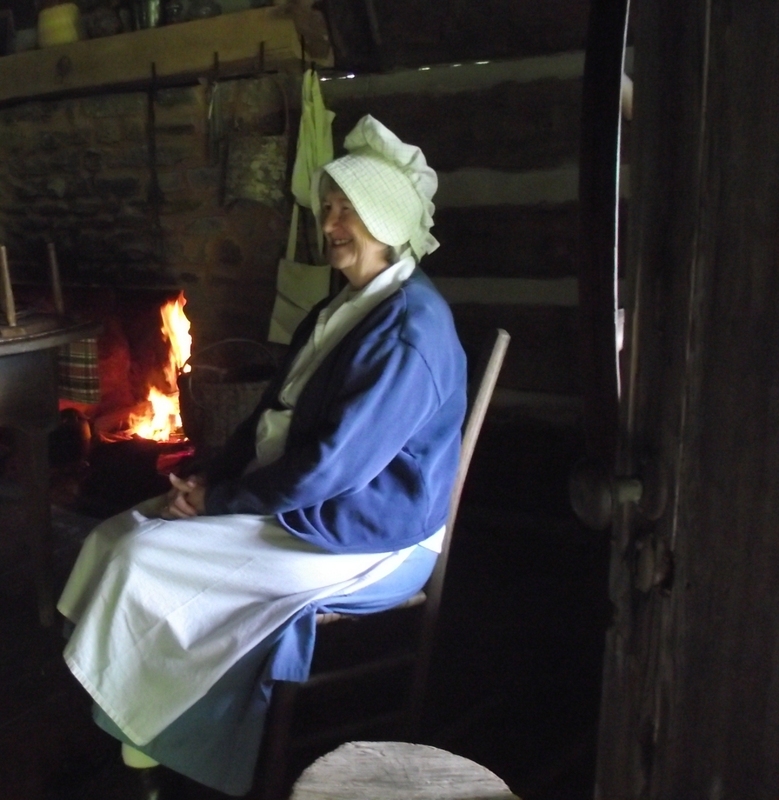 Dressing in period clothing, these volunteers take part in History Alive programs in the Appalachian Settlement. Some have special crafts such as quilting, woodworking, music and weaving. 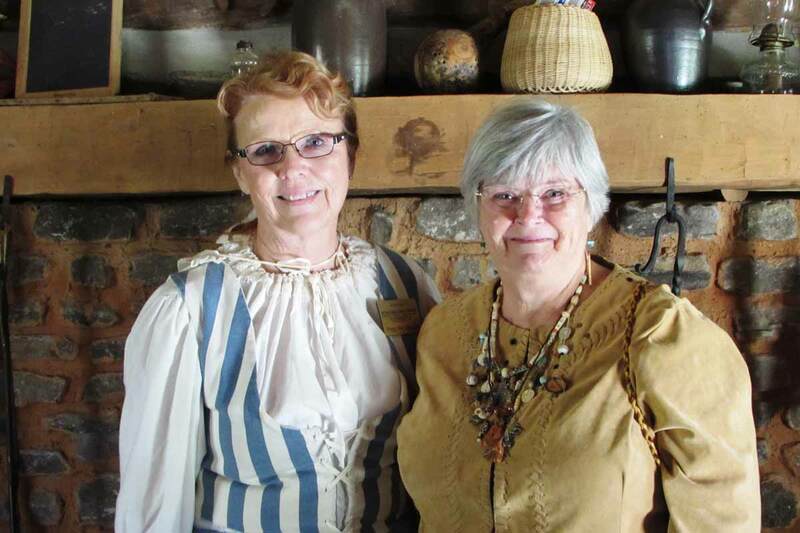 These very important volunteers describe how pioneers lived during 1840s and offer children an opportunity to peek into the past. They also provide interpretations for special events. Below, Peggy Anderson (l), Susan May (c) and Mark McClellan are all retired teachers. Peggy taught elementary school, Susan was a music teacher and Mark a high school history teacher. All enjoy their living history volunteer positions. Volunteer gardeners help maintain the landscape around the facility. There are two fern gardens, native plants surrounding the building and a butterfly garden. William Van Buskirk (R) has been a volunteer gardener dedicated to keeping up the facility landscape for more than five years. His wife volunteers at the front desk as a receptionist.